Wafuku is having a SALE! On my www.wafuku.co.uk website I am giving 20% off all items priced between £55 and £350, until 14 May, 2017. 1. you can have your discount as cashback, refunded to you before your order is mailed. 2. you can email your order to get an invoice with the 20% already deducted, just email your order instead of using the site’s shopping cart. If emailing an order, give the item’s code (see example under picture below) and don’t forget to include your name and address too. I will then send you a PayPal invoice to pay for your order. NOTE* You do not need to have money in a PayPal account to pay, you can simply use PayPal to pay safely with your bank debit card. PayPal does not share your bank details with me, it keeps them safe and secure. Postage costs are on the site; if you use the site’s shopping cart it will charge full postage for each item, if you purchase more than one and they can be sent in one package, I will refund excess postage and packaging payment. Now is the time to consider that fabulous, genuine, Japanese kimono or to treat yourself to a gorgeous, pure silk, hand tailored haori kimono jacket. So why not check out my www.wafuku.co.uk website, providing vintage & antique Japanese kimonos & collectables, while this offer is available? Back in the 70s my mother bought three appliquéd, quilted waistcoats while on a trip to America. She loves them and still wears them, so last Christmas I made her a grey one with silhouettes that represented her garden and the wildlife in it, then I made her another for this last Christmas, with chickens on it because she used to have chickens back in the 1960s and I remembered that, when I was a child, she painted little cockerels onto all her biscuit tins, so the waistcoat is a memento of those things. It will be her 96th birthday next month, so I made her one more, this time it represents my love of Japanese things. I bought a pattern for a small quilt from The Gourmet Quilter and adapted some of the appliqué items from that for my mothers new waistcoat. I also bought a couple of inexpensive kokeshi brooches for myself, as mementos of making her the waistcoat. I wish this magazine was easily available in the UK. Yukata are ultra-casual, summer kimonos that are still very popular in Japan and worn by many to summer festivals etc. Further down this page you can see some fabulous, less informal kimonos for winter. Tasuki are used to hold the long, swinging kimono sleeves out of the way while working wherever they might be a nuisance if hanging loose. You can get tasuki clips, like the beaded one in that picture (available on my wafuku.co.uk website), which threads through the obi and clips onto the sleeves, providing a very elegant option to hold them out of the way, or you can simply use a koshi himo (soft tie) to do the job, as you see in the diagram. I was sent the diagram picture by a friend, so don’t know who to accredit for it. Check out all the wonderful kimonos in this wa-art.net site’s display of winter kimonos – HERE. I particularly love the three below but there are many more at that link. Want to see some stunning kimonos and fantastic kimono styling? Check out the Akira Times blog. I found more photographs of celebrities in kimonos. These are in addition to the celebrities in kimonos I also have HERE. Everyone loves a kimono, regardless of gender, status or era. Ever gorgeous. I love that ichimatsu obi. Looking cute in a shichi-go-san kimono. Culture Club, with Boy George. George wears a colourful kakeshita kimono while the other band members go for monochrome patterned cotton yukatas. She is wearing a kimono that cost $3,000 way back in 1900. Evelyn Nesbit was a popular American chorus girl, an artists’ model and then an actress. She lived a life of controversy and died in 1967, aged 82. Wearing a lovely houmongi kimono . In kimono and hakama, complete with katana. He seemed to have a great liking of Japanese Kimonos and, of course, his Ziggy Stardust tour costumes were designed by a Japanese designer, Kansai Yamamoto. I think his short kimono type garment in the photo below is by Kansai Yamamoto. Marlene Dietrich posing in a very beautiful, Japanese furisode kimono, with striking design of Japanese cranes. Cranes signify loyalty and longevity. Did you know that Japanese, red crowned cranes dance for each other. Not just to win a mate, they mate for life and continue to dance for each other. It is such an endearing trait. I posted this in a previous post but feel he should be in one that lists kimono clad celebrities. Wafuku.co.uk in another magazine feature. My website and I were part of a feature in the How To Spend It, the FT magazine, a few months ago, in their fashion edition. I have two of these huge kumihimo; they are enormously long, hand braided, silk cords, each with a loop at the centre and lovely tassels on the end. They are unused and the tassels are still wrapped in paper. I have no idea what they are for . I think they may have been made for a Buddhist or Shinto temple, because they very thick and long, pure silk, hand made, rather special and must have been exceedingly expensive to produce. They are really rather lovely and, when you move the cord about in your hand it has that lovely sound that silk makes, like footsteps in deep, crisp, new snow. In that photo my daughter is holding just one of them. This floaty, contemporary kimono is by Hayami Mariya. Here she is again, wearing a kimono of same type and size. She is not a tall woman, so it is ankle length on her; on a tall woman they would be shorter. Check out these great cat obis. I would love these. Happy New Year of the Rooster. I apologise for the lack of new blog pages. Time seems to get away from me. I will try to get back to post again soon. In the meantime, happy New Year, the year of the rooster. NB – If you see an advert on this page, it is put there by WordPress, it is not put there or endorsed by me. Three posts in a row. Suddenly there is no stopping me. It’s mostly, I suppose, that I had too much to put into a single post, so have divided it into three. I find it hard to get started again when time passes but I’m on a roll at the moment and want to add the last of my current thoughts to the blog. While browsing online the other day I came across these wonderful, leather shoes on a Japanese website called Sou-Sou. They are hand made to order, so the prices of about £275 to £350 ($390 to $499) per pair doesn’t seem that bad, even if a good bit higher than I pay for my shoes. A pair of my own. I own this pair of shoes, not actually Japanese but from Irregular Choice’s Japanese influenced range. I have only worn them once so far, though have had them for years. I so rarely wear heels nowadays but I love an unusual shoe. These ones are suede and canvas. One of my kimonos featured in Beyond Magazine. This is one of my antique tomesode kimonos, which was requested by Beyond Magazine for their World In Seven Objects feature. It is a lovely magazine, with beautiful photography and graphic design. My 94 year old mother owns and wears 2 boxy, quilted waistcoats she bought at a craft fair in America way back in the 80s. They are very simple in shape and comfortable to wear. She has one with poppies and wheat, a couple of butterflies and a little mouse appliqued on the back and one with a large moon, a hills and a frog. The applique is done in a mix of plain and small patterned fabrics. She is very difficult to select gifts for, so I decided to make her a new quilted waistcoat as her Christmas gift. The simple shape was easy enough to make a paper pattern from; there are no darts or sleeves or tricky bits to deal with. I thought of something colourful, then opted for neutral, to go with almost anything, so I made the waistcoat grey and the applique black silhouettes. I chose things that relate to her own garden, her love of hollyhocks (though she only likes the single ones, not double blooms), the foxes and badgers she sees visiting her garden at night, the many, many crows of various kinds that nest in her trees and are fed by her, the owls we can hear at night (and are in the family coat of arms) and, of course, the squirrels. My mother lives in an ex-farmhouse, which has a decent sized garden and a 5 acre field. The top section of the field, visible from her kitchen window, was a solid mass of rosebay willow herb. It is a very, very tall weed with a pinkish purple spiked flower and fluffy, wind borne seeds. When it dies off in autumn, the tall, brown dead stems remain. It can be quite pretty when in flower but it is invasive and takes over and we grew to hate it. We also hated the week or so each year of the air being thick with its fluffy seeds. It is one of those opportunistic plants that grows anywhere, you see it on every piece of waste ground, every vacant lot, in every corner and crevice it can find and in roofs and drainpipes of tall, old buildings. When not in flower it is just ugly. A few years ago my brother decided that, on his visits a couple of times each year, he would dig out the rosebay and turn that area into a wildflower field. It took him years to get rid of the stuff and the couch grass that tried o take over in its place. There are still the occasional bits of rosebay and tough grass being found and removed but in 2015 it finally came to fruition and was a mass of wildflowers for months. Mostly tall white daisies and yellow ones, with poppies, cornflowers, red campion and various others mixed through it. It was quite lovely. He and I have added loads more seeds, including hundreds of thousands of poppy seeds (I especially love poppies), so it should be even better this year. So, the cow parsley on the waistcoat represents my mother’s field because it has always grown in the field and a few bit hang on in among the wildflowers. She really doesn’t enthuse about gifts but she did enthuse about her new waistcoat, which was pleasing. She seemed to genuinely like it and its associations. Above you can see it appliqued and layered with wadding and backing, ready to be trimmed and sewn together. It is the first time I have ever done applique. My brother at the edge of the wildflower field and my daughter in it modelling Japanese garments for my website. This lovely furisode style, silk kimono has a wonderful pattern of butteries on it. It has been a very expensive kimono and they have gone to the added expense of including some butterflies on the inside of the lower fronts, even though they really aren’t seen. It is a kinsai kimono, which means it is embellished with metallic gold or silver; this one has gold lacquer work clouds. I really like the flowing water pattern in the weave. Finally, since David Bowie died this month, much to the surprise of most of us, I thought I’d post a photo of him wearing a Japanese yukata kimono. Sadly I was unable to find a picture of the actor Alan Rickman in a kimono, who also died this month. I was watching that television show (ITV, UK) and noticed a lovely furisode kimono in the window display. The picture is poor quality, as it is a screenshot from the ITV iPlayer and they reduce quality for streaming but it does let you see the kimono. The show stars Jeremy Piven as Mr Selfridge, the man who opened the store Selfridges that still exists in London. He is good in it, just as he was very good in his role in Entourage. Are kimonos only for the purists? I read a comment on Reddit the other day, in which a Japanese woman said she felt that only Japanese people should wear kimonos and only those who applied all the strict Japanese rules about how they are worn, with obi etc., and wearing the correct kimono for the occasion and person’s age. She felt that no one other than a purist/traditionalist should be allowed to wear them, particularly those wearing them as house robes; she even said it was offensive (her word) to see the pictures of Rita Ora wearing one of my kimonos or to see anyone wearing one as a robe like that. The woman who said this is the only person I have come across to say this, all other people I have spoken with or read comments by, including many Japanese people, do not think that way at all, in fact, quite the contrary. Needless to say I did not agree with her. To me, what she said is exactly the same idea as saying that women should not wear trousers because they were originally designed only for men to wear. I felt she should also bear in mind that haori were originally meant to be worn only by men but, many years ago, geisha broke that rule and started wearing these men’s jackets, after which, they became popular among other women and only then did haori start to be made specifically for women, so you now get many women wearing them. If that rule had not been broken, the women of Japan would not have haori to wear over their kimonos. If that rule could be broken in Japan, there is no reason not to break other kimono wearing traditions, especially when they are worn in The West, where kimonos are not worn as day to day, outdoor clothing and haoris not worn over them. Since kimonos are rarely worn the same way in The West as they are in Japan, with obi or as outdoor clothes, it seems very pedantic to think that they should not therefore be worn there at all or that the Japanese traditional rules, dictating the styles and patterns for certain ages or occasions, should be adhered to by absolutely everyone who chooses to own and wear one either in or out of in Japan. As you can see in the two pictures below, this Japanese man, in Japan, wears a kimonos with braces on top, attached to the obi, giving the traditional kimono wearing a slightly more contemporary look (photos from Akira Times). 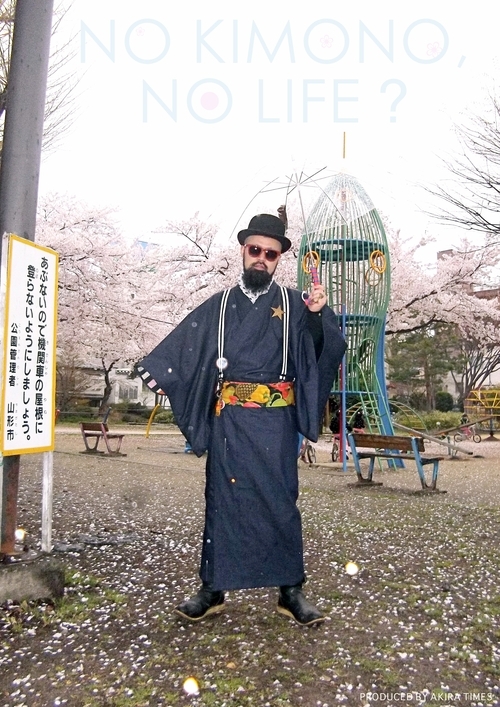 If Japanese people like him may break the rules and do that, why may others not just wear a beautiful kimono as a house robe, regardless of tradition? Why restrict them to only those who wear them the traditional way, with obi, and applying the strict age, occasion and colour rules? 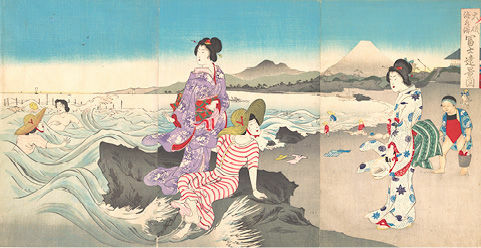 The woman also thought that, if worn as a robe, it was appalling that it meant that the kimono would be worn frequently and the silk would touch the skin and therefore need cleaned more frequently than one that was rarely worn and only worn the traditional way on top of a naga-juban, so not touching the skin. She seemed to insist that they only be cleaned using the araihari method, which is a traditional one of completely dismantling the garment, cleaning the individual pieces, then remaking it, traditional method that resulted in rarely cleaning them, whereas I believe that careful dry cleaning is an acceptable alternative for a kimono that is used frequently as a robe. Most vintage kimonos would become nothing more than moth food or be cut up and destroyed or would just sit in a box and never see the light of day and be appreciated if many were not re-purposed as robes or worn in some other non traditional way. Their being worn has to be a good thing, regardless of how they are worn, rather than all of them being hidden away, unappreciated for the majority of the time simply so they don’t get worn out or dirty. Without a doubt, that woman would not approve of haori being worn in The West over yofuku (clothing that is not traditionally Japanese), such as you can see in the picture below. What a loss that would be. The haori is such a gem when worn with western world clothing. Even in Japan nowadays, young people are sometimes seen to be wearing kimonos in deliberately non-traditional ways. The traditional rules are fine for kimono purists but I do not believe it is fine to say that they may only be worn by the purists and in the ways the purists dictate. I am very glad the old kimono rules are still maintained in Japan by some, whom I admire for doing it and keeping those traditions alive, but that should not be allowed to stop their use by those who choose to not follow those rules. I really do admire any person who abides by all the strict kimono wearing rules in Japan but do not feel they should be reserved only for them. Kimonos are clothing, not religion, not part of only some private club, so should be worn and enjoyed whatever way one chooses, as long as they are worn and loved and their beauty seen and enjoyed. No doubt she would be utterly horrified to see my sister wearing a girl’s kimono open over western clothes, as a pretty evening coat, or, as you can see below, my daughter wearing this child’s antique kimono as a dress. 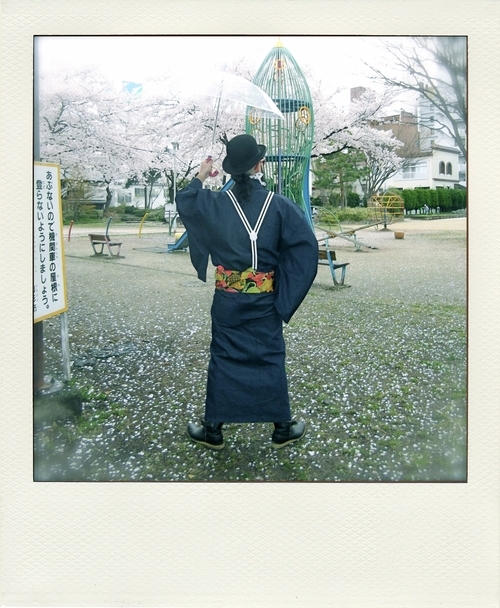 There is room for both purists and non-purists to wear wafuku (traditional Japanese clothing). It does not matter how one chooses to enjoy wearing it, it only matters that one does choose to do it and that their beauty and the work of the skilled Japanese artisans can be seen and appreciated. Cable companies want to slow down (and break!) your favorite sites, all so they can profit. What we have now will slow to a crawl, sites taking forever to load unless we pay a premium to get extra speed. This is what cable companies are pushing the government to give them. FIGHT THEM now or regret it forever. It is up to US. Click here to take action. 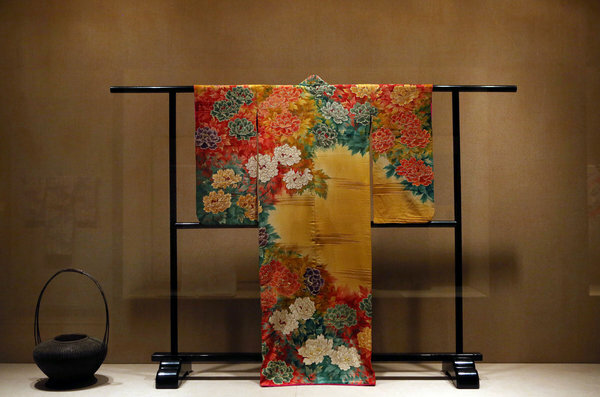 The Metropolitan Museum of Art (USA) had an exhibition called, “Kimono – A Modern History”. It ended on 19 January 2015 but you can read about it on their website HERE. On that page there is a long and very interesting video, full of information about kimonos and their influence on the West. As I said, though, it is long, 1 hour and 22 minutes long, so get comfy and soak it all in. It is worth the time. The video is full of examples of how Japanese kimono influenced western fashions, such as this coat by Worth in 1890, with its slightly westernised version of Japanese textile art. There is lots more information about kimonos and their influence on the West in the video HERE. The latter half of that video shows how the obi is tied on some different formal types of kimonos (houmongi, furisode and shiromuku – white bridal kimono). The picture below is a screenshot from the video. The camera work doesn’t show the process as clearly as one would hope but you get an idea of how to tie this style of obi. The finished fukurizume musubi (puffed sparrow knot). She also shows one like a huge flower, a more standard square, taiko knot and a bride’s bunko style knot and accessories. She explains why the standard obi knot is called a taiko knot (otaiko). As I mentioned a long time back in a post here, most people, including the Japanese, say it is so called because it looks like a taiko (a Japanese drum) but that has always infuriated me because it is not the reason at all. It was named after the Taiko Bridge where, at its opening ceremony, some geisha tied their obis in this brand new, never before seen style and, as was usual with anything geisha wore, it immediately became the fashion among all women, so the knot is named Taiko after the bridge, and it has remained the most popular obi knot ever since. It is really more folded than tied but we still call it a knot, the Japanese call it a musubi, so it is a taiko musubi. The screenshot below shows the examples in that Metropolitan Museum’s video. The bottom of that article has a link to a previous article they did on Kimonos, in mid 2014, mostly about Western, contemporary takes on the kimono but it also featured a photograph of Rita Ora wearing a kimono from my own website, wafuku.co.uk, taken in 2014. It is the black and white image in The New York Times’ trio photo below, where Rita Ora is wearing a vintage, pure silk, Japanese kimono; it’s a furisode style kimono, with those wonderful, almost ankle deep sleeves. It was quite a surprise to just chance upon one of my kimonos on The New York Times’ website and find that it had also been shown in the July 3, 2014, Fashion & Style section of the The New York Times print newspaper, with the headline, “For Spirits That Can Only Be Tied Down by a Sash”. I weakened and bought myself a traditional, Japanese schoolbag backpack, known as a randoseru. Mine isn’t real leather because leather ones cost a fortune. The one I really want costs around £300, plus delivery and import tax, so this one, which was by no means cheap, will have to suffice. 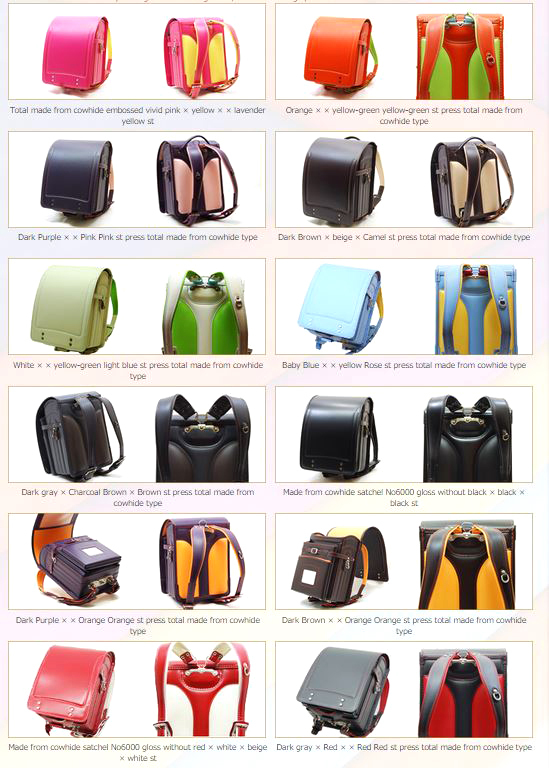 Randoseru have this very specific shape and are generally well made, long lasting bags. I like backpacks as my ‘handbags’, with the choice of carrying in my hand, over my shoulder or, for any long time, on my back. I haven’t seen it up close yet, it is still winging its way here from Japan. Red is the traditional colour for girls randoseru and black for boys. Nowadays a big variety of colours and two-tones are available, though many of the more conservative Japanese schools dictate the colour to be used. The use of the “randoseru” began in the Edo era. Along with a wave of western reforms in the Japanese military, the Netherlands-style rucksack called “ransel” (Japanese: ランドセル randoseru) was introduced as a new way for the foot soldiers to carry their baggage. 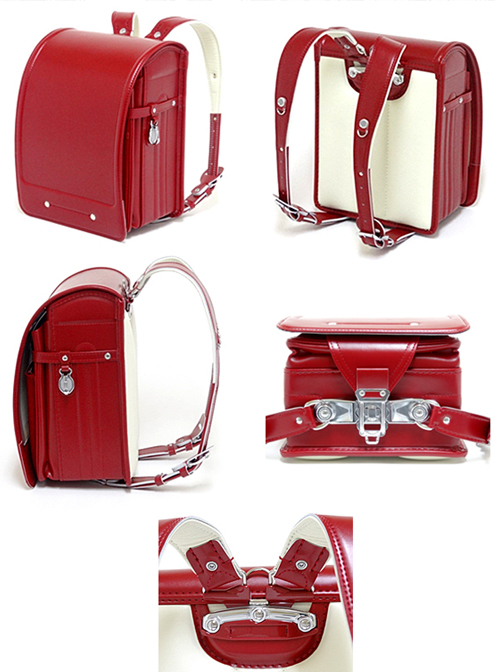 The shape much resembled the “randoseru” bags used today. In 1885, the Japanese government, through the elementary school Gakushūin, proposed the use of a backpack as the new ideal for Japanese elementary school students. At Gakushūin, the practice of coming to school by cars and rickshaws were banned, promoting the idea that the students should carry their own equipment and come to school by their own feet. At this time, the bag looked more like normal rucksack. This changed, however, in 1887. The crown prince of the time was given a backpack upon entering elementary school (at Gakushūin). To honour the soldiers of the country, the shape of the backpack resembled the backpacks used in the military, in other words a “randoseru”. This quite immediately became the fashion, and the shape have continued to become the “randoseru” used today. However, at this time most of the Japanese people could not afford such an expensive bag. Until the dramatic rise of economy in Japan in the past-WWII period, the main school bag in Japan was simple shoulder bags and furoshiki (square folding cloths). It is a popular saying that the metal clip on the side of the “randoseru” was used in the military to carry grenades. However, this is not true. The metal clip was introduced in the past-WWII period, as a means to carry lunch boxes, change of clothes for P.E., etc. Most randoseru production is carried out by hand. A randoseru is constructed of a single-piece body and around 200 fittings, a combination of die-cut materials and urethane backing plates. Assembly involves crimping, machine-sewing, walnut-gluing, drilling each shoulder strap, and riveting. The bag’s materials and workmanship are designed to allow the backpack to endure the child’s entire elementary education (six years). However, the care usually given to the randoseru throughout that time and afterwards can extend its life and preserve it in near-immaculate condition long after the child has reached adulthood, a testament to its utility and the sentiment attached to it by many Japanese as symbolic of their relatively carefree childhood years. A typical randoseru measures roughly 30 cm high by 23 cm wide by 18 cm deep, and features a softer grade of leather or other material on those surfaces which touch the body. When empty, it weighs approximately 1.2 kilograms (2.6 pounds). However, due to demand for a lighter, more robust randoseru, as of 2004 approximately 70% are made from the synthetic leather Clarino. Also, in response to Japan’s revised curriculum guidelines from the fiscal year 2011, there is a growing demand for bags large enough to hold A4 standard paper files without bending. Manufacturers are divided as to whether to support an increased bag size or not. The randoseru’s durability and significance is reflected in its cost. This site sells the ones I like best. I would love to own one of those, possibly the pink or a lime green one. They make them to order, out of high quality leather. And their two tone Randoseru are gorgeous.